I hit the jackpot in my Target dollar section this month. 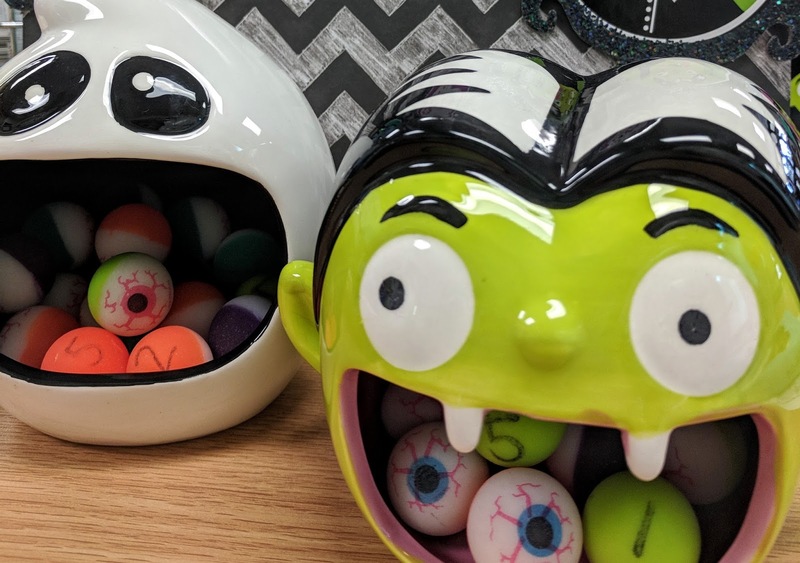 Such cute Halloween items, I just had to create some math fun with all of this cuteness. Here are a couple of easy to prepare math games you can use with your students. I adapted them for multiplication but you could easily do addition, subtraction or whatever skill your students might need to review. I took two of the cute ceramic holders. 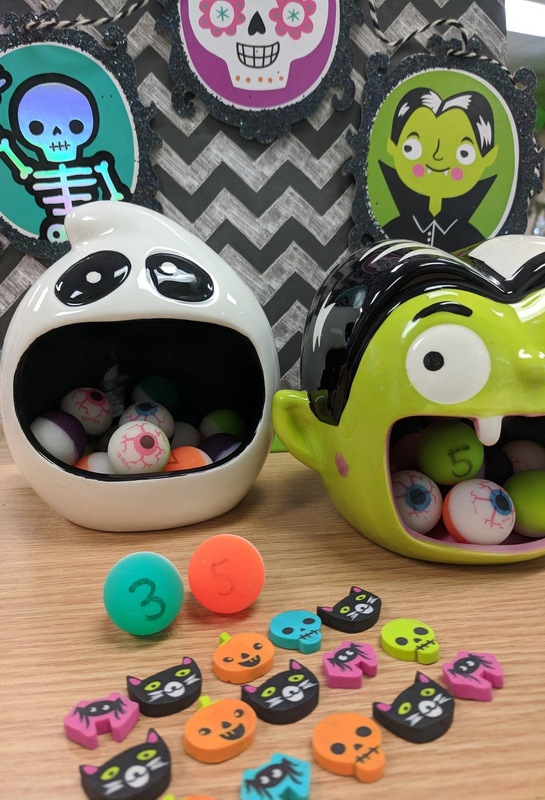 I took fun eyeball bouncy balls and used a sharpie to write numbers 0 - 12 onto them. I took one Frankenstein and one ghost and filled them equally with the eyeballs. Quick and easy math game. In partners or independently you choose one eyeball from each container and create a multiplication problem with it. Answer it if you know it off of the top of your head. 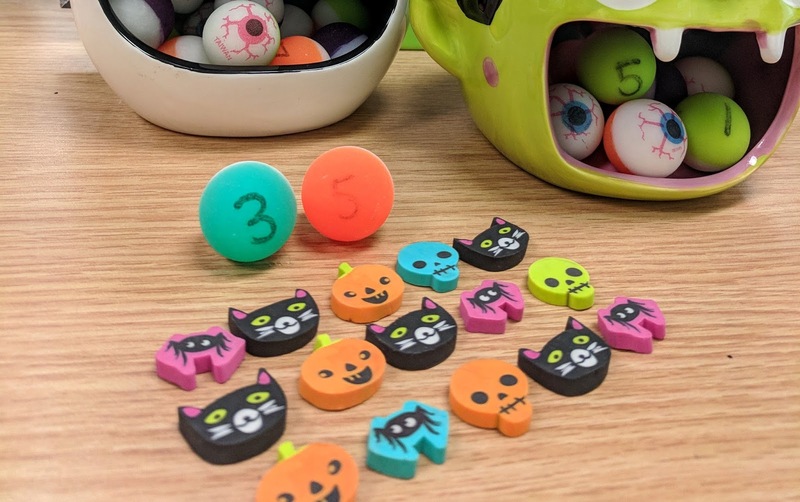 If you don't then just use the Halloween erasers to create an array to solve your multiplication problem. Another great way to review is to grab some of the spider cutouts, have students roll a dice to count out how many spiders to draw from a bucket. When they draw their number of spiders they have to count by 8's to solve. How many total spider legs in all? 8, 16, 24, 32, 40, 48. It's that easy....Just a few fun items from Target and you are on your way to a fun math review game your students are sure to love! 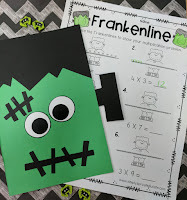 Here are a few more fun math activities to get you in the Halloween spirit!